You may recall that, back in March 2016, VA announced its participation in the 100 Million Healthier Lives initiative through the “Veterans Hub,” a combined effort of VA, Community Solutions, the Samueli Institute, DOD and the Department of Health and Human Services’ Health Resources and Services Administration. Essentially, the Veterans Hub is a collaborative partnership with federal, state and nongovernmental organizations dedicated to improving Veterans’ health and well-being. Hub partners use the 100 Million Healthier Lives platform to leverage partnerships in areas that impact Veterans, to include housing, employment, education and health. The goal of the Veterans Hub is to encourage a healthier lifestyle for Veterans by the year 2020. How are we doing our part? 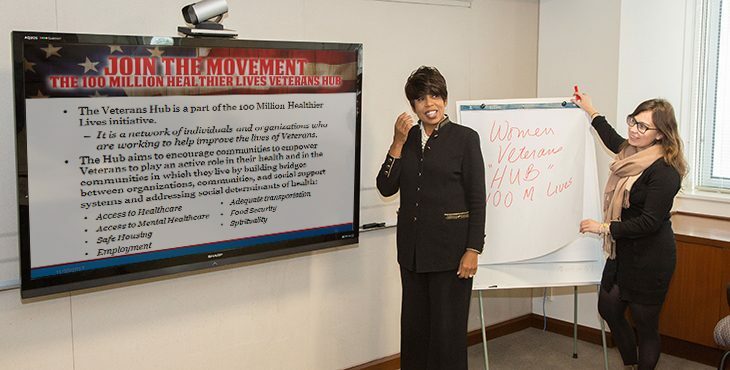 By focusing our outreach efforts on educating women Veterans about various government and collaborative partners’ initiatives to address the impact areas previously mentioned. We also keep women Veterans informed about VA’s efforts to enhance the services it provides to Veterans through our weekly updates—which women Veterans and other stakeholders can sign up for on our Web page—and encourage them to contact the women Veterans call center to learn about their health care benefits. You can join the movement too. Just visit the 100 Million Healthier Lives webpage, to see the introductory video and for a plethora of information right at your fingertips. So, whatever office, group or community you represent, you can sign up to do your part and share information on available resources. Lives may be saved, just by knowing the information. It really is that easy. Dr. Betty Moseley Brown is the associate director of the Center for Women Veterans where she assists the director in advising the Department of Veterans Affairs (VA) on programs and issues related to women Veterans and serves as the Lead for the Women Veterans Program. Her passion for Veterans began during her United States Marine Corps service from 1978 – 1992. Her VA career, spanning decades, began in the Veterans Benefits Administration (VBA) in San Diego. She served in various positions, to include a Veterans Benefits Counselor, management analyst in Compensation and Pension Service, and later working for the Associate Deputy Under Secretary for Policy and Program Management in Washington, D.C. I recently sent the following letter to the White House in an effort to try and open a discussion concerning the unconstitutional discharge of women who became pregnant during their military service. This occurred during the 40’s thru the early 70’s. Many of these women had years of service prior to discharge and were never able to retire out. What an injustice to all women. discharged due to pregnancy. The action was found unconstitutional in 1976.
my life, I love to stand as a veteran yet I feel guilty doing it. removing the back pay clause. Many women may not be in my position. health care benefits or possible assistance with elderly care facilities.